A perfect yarn for the in-between seasons of spring and fall, Bamboo Bloom is a lovely textured fiber that lends itself to garments and accessories that have a shabby-chic look. 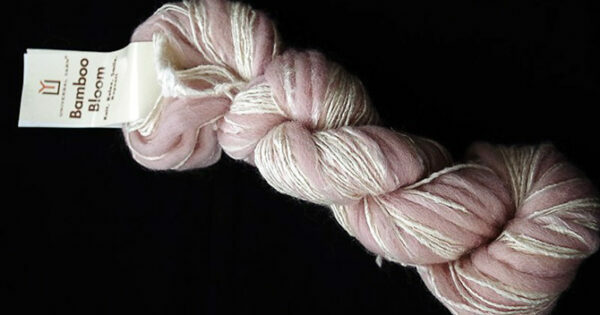 I’d like to introduce you to this thick and thin yarn and highlight its inner beauty and qualities. Bamboo Bloom is a thick and thin yarn developed by Universal Yarns and produced in Turkey. Each hank contains approximately 154yds [140m] and 100g of yarn. The fiber content includes 48% rayon made from bamboo strands, 44% wool and 8% acrylic. 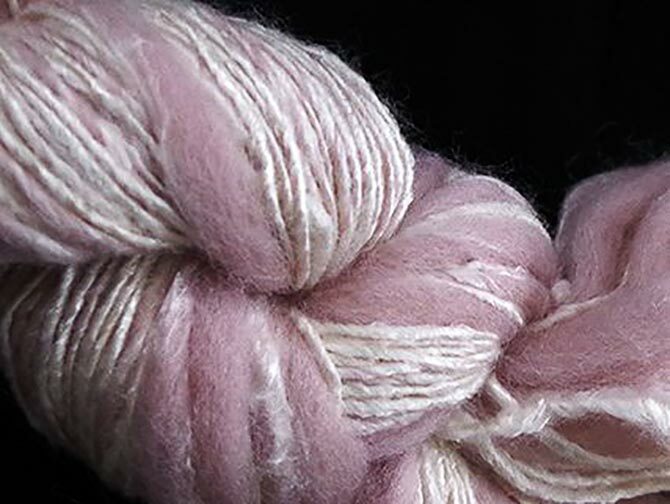 Rayon from Bamboo is a very slippery fiber with long slippery individual strands, so acrylic that has a bit of tooth (or grip) to it and comes in shorter strands is blended together with it to act as a bit of a binder to keep the yarn from untwisting. Both bamboo and wool are light weight fibers, and for a yarn that’s labelled bulky (or chunky), it’s not heavy or bulky in feel at all. Bamboo Bloom comes in 12 solid colors and 22 multi-colored hand-paints. Items knit from this thick and thin yarn will be on trend in two ways. You can knit at a chunky tension or gauge to get that big and bold look, or you can use smaller needles and achieve a closer knit fabric that still has a lot of drape and movement for that shabby-chic ‘drapey’ feel. These are strands of the Bamboo Bloom thick and thin yarn in Rice color. The yarn is spun before it is dyed. When it’s immersed in the dye bath, the different types of fibers take the color in at different amounts of intensity. 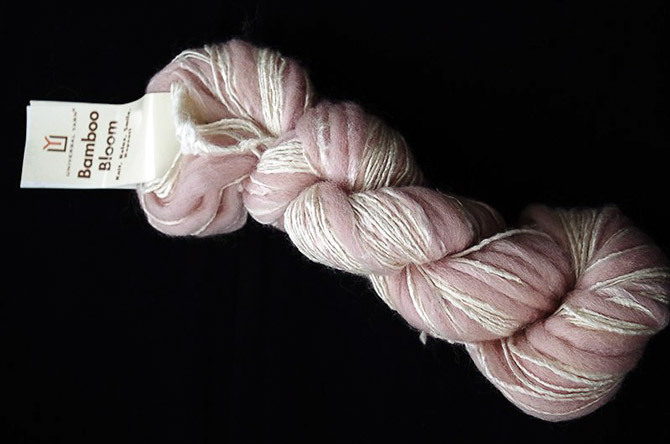 You can see that there is a champagne pink hue to some of the yarn and much fainter version of champagne in other sections. The thin sections of the yarn feature the bamboo fiber mostly. It’s a one-ply yarn, so all the fibers are combed to be parallel and then spun tightly. There’s no binder thread spun around the single ply to hold things together. The way Bamboo Bloom is spun requires no extra support. It can stand on its own. The puffy sections of the yarn feature wool mostly. The wool sections have slightly less twist to them, but they are sturdy enough that it’s not that easy to pull or tear the yarn at the thick sections. The wool is very soft and fine and after rubbing it against my neck or inner elbow, I would give it an itch factor of 0 to 0.5 on a scale of 0 to 10 where 10 is so scratchy that I’d have to wear 2 layers of clothing under it to be comfortable. So that’s soft. In this close-up of Bamboo Bloom, you can see how the bamboo rayon strands gradually give way to the puffy wool fibers. To me it looks like a tree branch that’s keeping a tight grip on some Spanish moss. 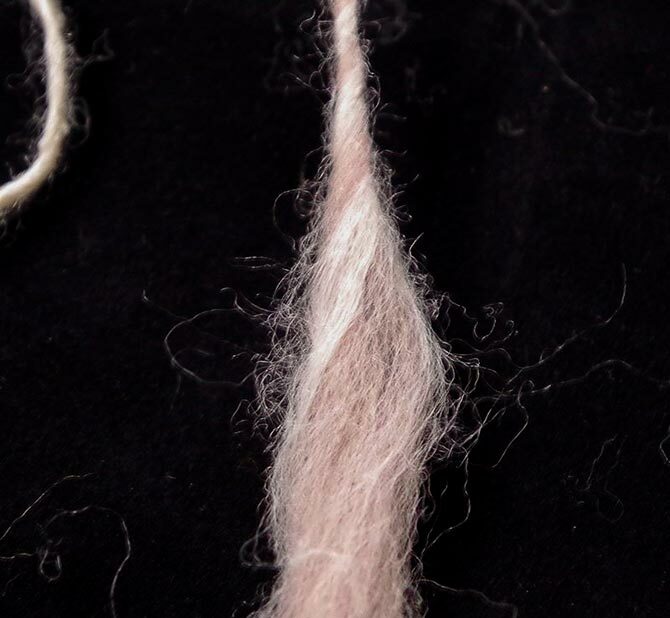 You can also see the color differences clearly between the wool, which has taken in more of the dye, and the bamboo, with just a slight blush. 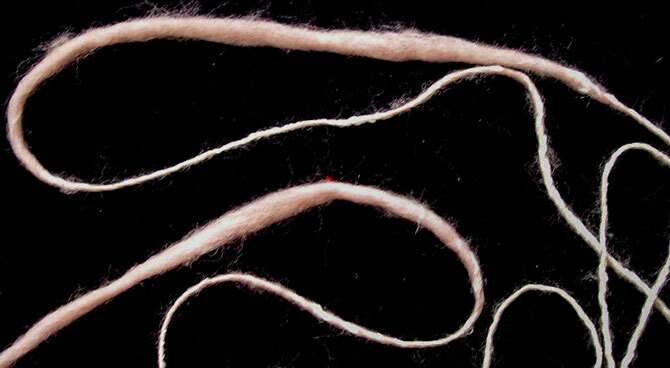 Tomorrow we’ll look at how this thick and thin yarn knits up at different gauges or tension. This is a beautiful yarn and I think it would make a lovely scarf! I love all bamboo yarns, but this one looks like it would be fun to knit with. Lots of ideas to experiment with many tensions and designs. You are very right Cindy, the possibilities seem endless with this yarn. did you see the cowl post from February 26th? Lovely hue of pink. Thank you for sharing. It’s a delicate hue of pink, and it’s called ‘Rice’? I don’t understand it, but I still LOVE it!